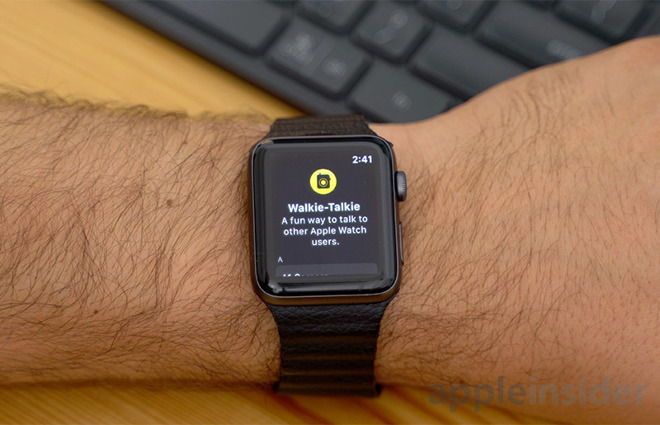 With the Walkie-Talkie app, all Apple Watch owners, except for those with first-generation "Series 0" devices, will be able to communicate with each other simply by selecting a contact name and pressing a button. Opening the app, users are greeted by a splash screen reading, "Walkie-Talkie, a fun way to talk to other Apple Watch users." Below the message is a list of your contacts. To add someone to Walkie-Talkie, just tap their name to send them an authorization request. Likewise, when someone adds you to their Walkie-Talkie app, you'll get an automatic request asking if you want to pair. 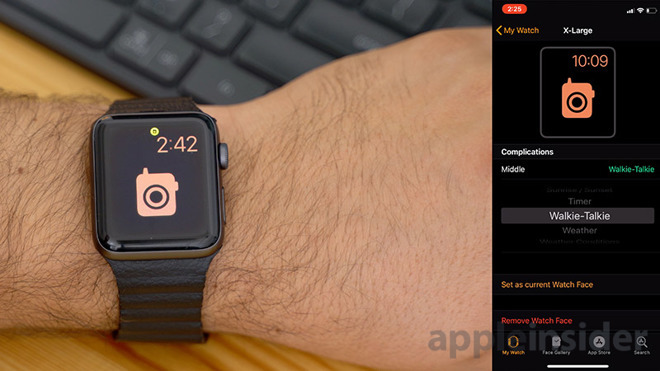 Users can add anyone, even friends who don't own an Apple Watch. It would be nice to limit contacts to those who have compatible equipment. To remove a contact, just swipe their name card and press the "X" icon. Once you have a contact added, the app is enabled by default and a shortcut icon shows up at the top of every watch face. If you don't want to be interrupted by an audio message, you can disable Walkie-Talkie by swiping down and toggling the "Available" switch to "off," an action that also removes the shortcut. All watch faces supporting complications will be able to use the new shortcut icon for the Walkie-Talkie app. Starting a session is straightforward. Select a contact from the list and, once connected, hold down the large "Talk" button while speaking and release when done. If your contact is available they will hear a notification sound and feel a haptic feedback vibration before your voice message is played. The system works in real time with virtually no delay. Just like real walkie-talkies, only one person can speak at a time and if the other person is sending audio, your "Talk" button turns into a dynamic circular waveform. Spinning the digital crown will lower and raise the volume. If you try to talk to a contact that has Walkie-Talkie disabled, the app will let you record your message and will try to connect. After about about five seconds, you will get a message saying they aren't available. If someone tries to contact you while you are not available, you will get a notification that they tried to reach you. 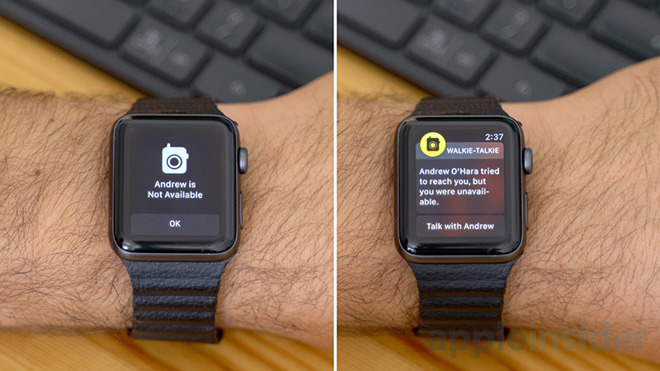 Watch will then give you the option to talk to them, open walkie talkie, or dismiss the notification. We would love to have contacts turn gray in the app if they are not available to talk. That way we wouldn't have to send a message and wait for the connection to fail before finding out that they are logged off, and they wouldn't get a notification as a result. Walkie-Talkie is based on FaceTime audio technology and works over both Wi-Fi and cellular. When you select a contact, a connection is established that stays open for up to five minutes before timing out. By using a live call, nothing needs to be recorded, sent or downloaded, which makes the feature much faster and more private than previous push-to-talk solutions.